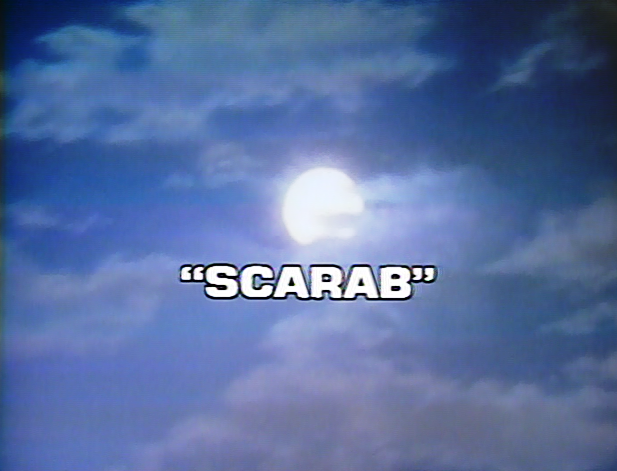 “Scarab” is the “evil Chaka” episode of Land of the Lost. And while it is a little strange to see the kindly Pakuni (Philip Paley) acting so violently and anti-socially, the installment works as a cautionary tale, especially for children. It’s all too easy, as Jack Marshall (Ron Harper) notes at one point, to let bad behavior grow and grow until it becomes self-destructive. In “The Scarab,” Chaka doesn’t want to do his daily chores at the temple homestead. Instead, he decides to capture a golden scarab that has caught his fancy. Chaka captures the insectoid, which is some weird “variety of beetle.” But when he mishandles it…it stings him. The sting, alas, transforms Chaka into a violent, deceitful individual. He puts out the fire in the Marshall’s temple, even as a thunderstorm approaches. He turns over shelves. He directs Grumpy into his friends’ path. He even runs to the Lost City and steals the head of the Oracle from The Library of Skulls. And when confronted about his misdeeds, Chaka is unrepentant. The Sleestak capture Will (Wesley Eure). They blame him for the theft of the Voice of Wisdom from the Library of Skulls, and threaten to drop him into the Pit unless the Marshalls find and return the skull. However, Enik saw Chaka steal the skull, and warns the Marshalls that the Paku has offended the Gods. Now Chaka must atone for his mistreatment of the beetle. The Marshalls help Chaka do just that, offering the golden scarab flowers. 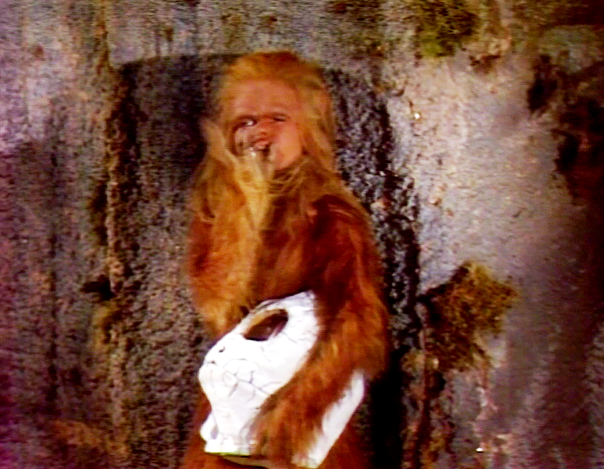 In the end, Will escapes and Chaka is returned to normal just as a thunderstorm comes down on the Land of the Lost. 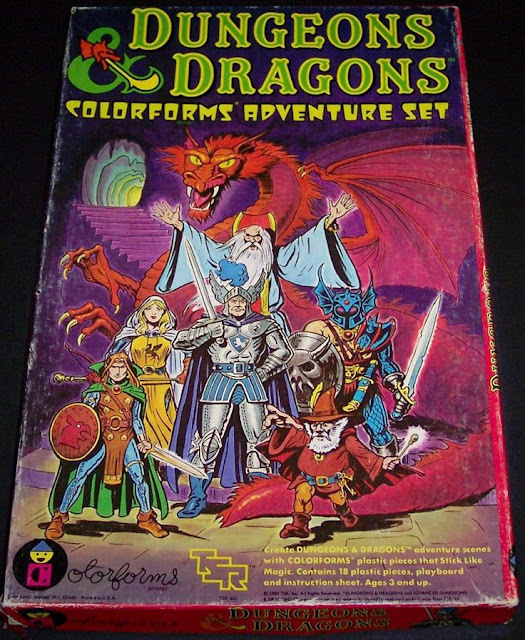 One thing I never want to do while writing these reviews of Land of the Lost is forget that the series is, by time-slot and design, conceived for children. Sometimes the series is so well-done and so intelligent that it is indeed easy to forget that. While I don’t think “Scarab” is a particularly strong entry in the Land of the Lost canon, I can nonetheless see its didactic value. In short, a lot of kids feel that if they do something wrong, they can’t come back from that something. Instead, they are now simply “bad” and must live up (or down…) to that reputation. That’s very much what happens to Chaka here. He’s unable to recover, until the Marshalls help, from a kind of anti-social death spiral. 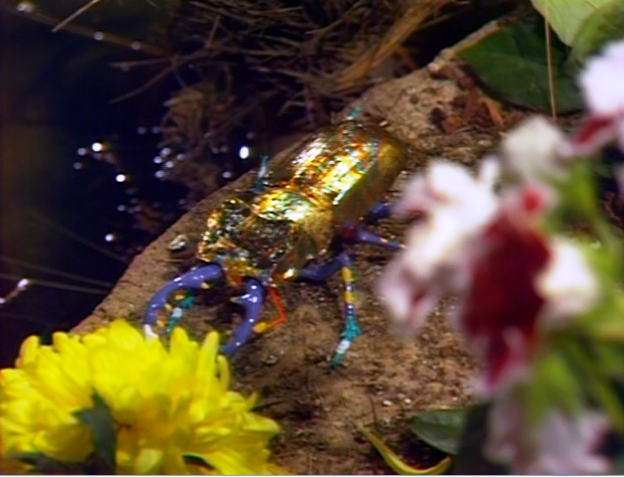 Although some elements of “The Scarab” don’t really work very well -- such as the idea of soliciting favor from an insect as the cure to a sting -- the episode certainly makes its point. I especially appreciate how Jack and even Enik [Walker Edmiston], for a change) don’t pass judgment on Chaka. Instead, they try to help; to talk to him. This is indeed what we expect from adults and caretakers: patience and love. Speaking of Enik, this episode represents the Altrusian’s last appearance in the series. John "The Scarab" episode was scary to myself as a boy in '76. The fact a scarab could bite Chaka turning him into an evil 'Mr. Hyde' was shocking. It was almost a commentary on drug addiction because the bite changed him and he needed the support of the Marshalls to withdraw.